Georgetown is one of the oldest neighborhoods in Washington, DC and because of its prime location on the Potomac River served as a major port and commercial center during colonial times. 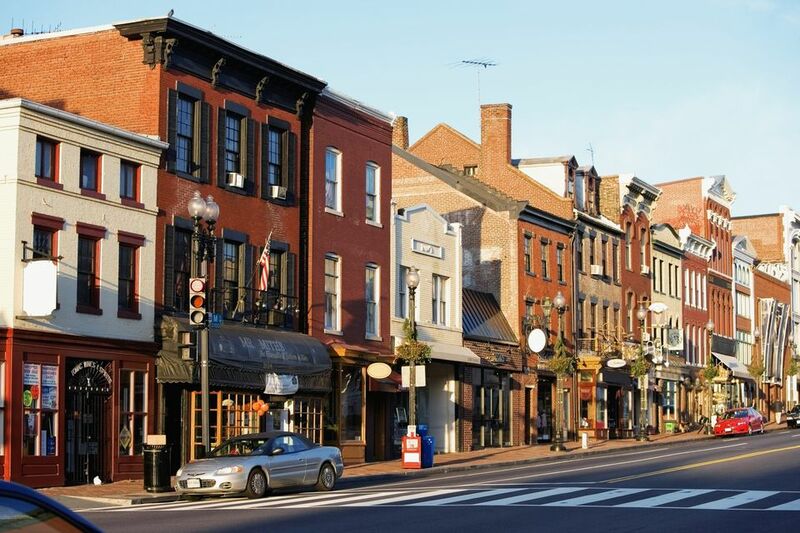 Today, Georgetown is a vibrant community with lots of upscale shopping and restaurants along its cobblestone streets. Enjoy these photos of Georgetown and get a glimpse of this wonderful part of town! Photo Above: M Street is one of the main streets in Georgetown with lots of upscale shopping and restaurants along its cobblestone streets. Photo &copy Rachel Cooper, licensed to About.com, Inc.
Georgetown is a Washington, DC neighborhood with many beautifully restored historic homes that date back to the 19th and 20th centuries. The Georgetown Historic District is roughly bounded by Reservoir Rd., NW, and Dumbarton Oaks Park on the north; Rock Creek Park on the east; the Potomac River on the south; and Glover-Archbold Parkway on the west. It is fun to walk around the area to see some of the magnificent properties. Old Stone House, built in 1765, is the oldest private home in Washington, DC. It is maintained by the National Park Service and is usually open to the public, but is temporarily closed for structural rehab. Old Stone House is located at 30th and M Streets in the heart of Georgetown. It is furnished with 18th century decor and features a small garden. Georgetown University has a lovely campus with historic buildings and beautiful grounds in the heart of Washington DC. ​Founded in 1789, Georgetown is a private research university and the oldest Catholic and Jesuit institution of higher education in the United States. The Georgetown Waterfront, also known as Washington Harbour, is a beautiful place to enjoy the views of the Potomac River. You can take a stroll, enjoy a drink or a meal or take a sightseeing cruise. Tudor Place is a mansion built in 1816 that was owned by Martha Custis Peter, the grandaughter of Martha Washington. The estate in Georgetown is now a museum with furnishings from Mount Vernon and a five acre beautifully landscaped garden. Dumbarton House is an historic home in Georgetown, built in 1798, that is run by the Colonial Dames of America. The house exhibits antique china, silver, furnishing, rugs and gowns. Oak Hill Cemetery, located on the north end of Georgetown, contains 19th century gravesites and is set adjacent to Rock Creek Park. Dumbarton Oaks is a 19th century mansion in Georgetown set on 16 beautiful acres adjacent to Rock Creek Park. The main house is a museum of fine art. Montrose Park is located at the north end of Georgetown along R Street between Dumbarton Oaks and Oak Hill Cemetery. The Key Bridge spanning the Potomac River from D.C. to Rosslyn, Virginia is a beautiful spot to take in kayakers and Georgetown's historic architecture. Read more about Georgetown. Explore the Dupont Circle Neighborhood in Washington, D.C.